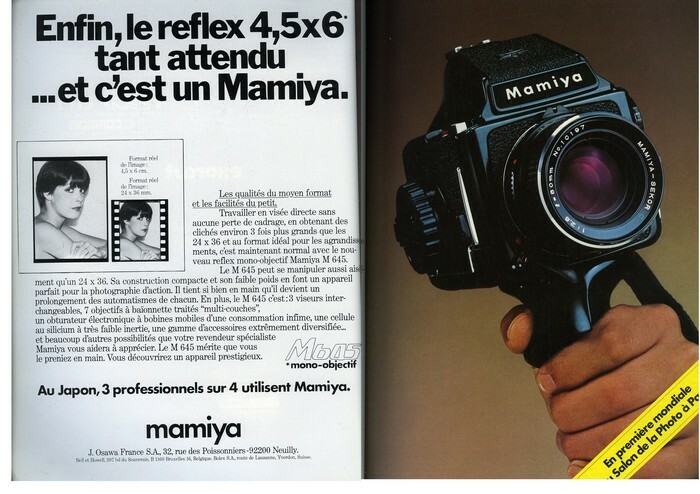 1976: Fortified by the hegemony of its RB67 medium format and spurred by the competition especially from Bronica, Mamiya decides to attack both the professional market and the market for advanced amateurs with a new concept, a comprehensive and flexible solution. 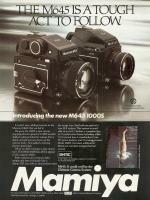 It is then why the first model of the 645 series was created, the M645, a small single-lens reflex medium format allowing sixteen 4,5x6 views on type 120 films or 32 views on 220 film. 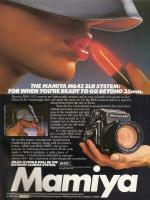 True to its reputation for quality, Mamiya sets a very high standard, both technically and by the modularity of the system. This system is built around a reflex camera body, fitted with a plane shutter electronically controlled with speeds ranging from 8 seconds to 1 / 500th second and B. 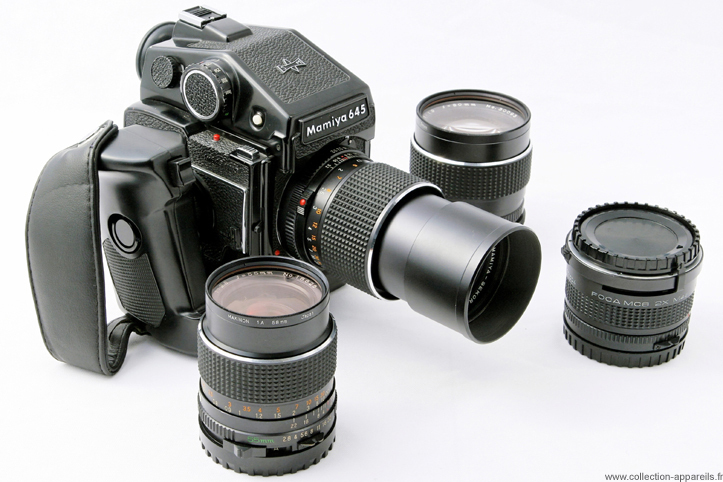 The lenses which at first ranges from the 55 mm to the 150 mm, the 2.8 / 80 mm being the standard focal length. 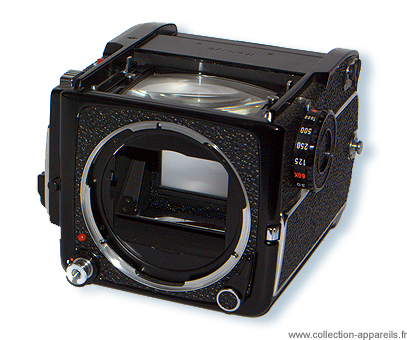 Viewfinders: with uncoupled CDS cell or coupled CDS cell (type S viewfinder), or angle viewfinder. A series of ground glasses is also adaptable to each. 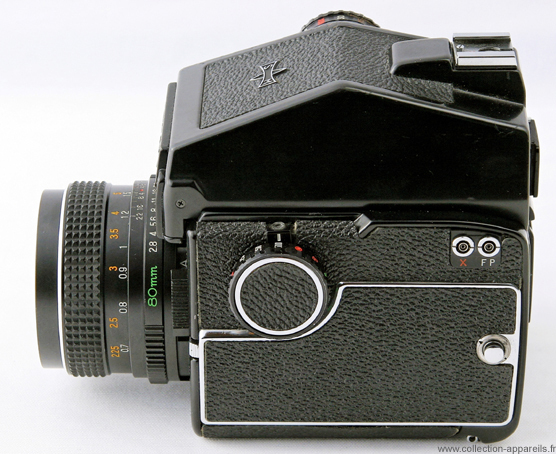 Note that the camera allows using the viewfinder S through a special position on the speed selector that requires only one battery to power both units. Film chargers 120 and 220 can be prepared in advance, and thus be available for immediate use without much manipulation. An impressive range of accessories completes the kit: Handles, motor handles, triggers, extension rings, etc. In use, the device is versatile, at least for the time. Its quality is impressive, its optics are remarkable and sought, but its ergonomics is average. Even if two triggers are available, the body is quite difficult to handle because of its weight and shape. The side handle quickly becomes indispensable. In addition, it is not a model of discretion, including while triggering. The fact remains that Mamiya has succeeded a master stroke, giving acclaim to a format still used today in the latest developments of the 645 ...... The concept comes even on digital, proof of the vitality of the concept. Because of its design, the general ergonomics of this device is quite disastrous. It improved significantly thanks to the handle with dedicated deferral trigger, available with or without motor. The viewfinder imposed to keep the vertical framing. As against the prism viewfinder, presented here in the version with a cell allows to target both vertically and horizontally which provides a much more flexible use. 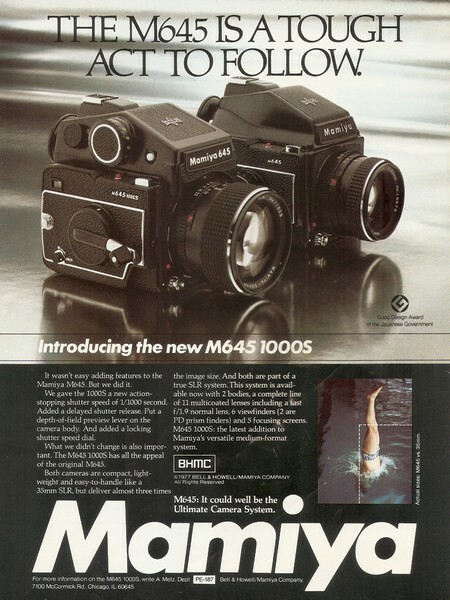 The back is not interchangeable, but the film is first inserted in a removable cassette which makes the film change relatively fast, provided of course to have several cassettes. 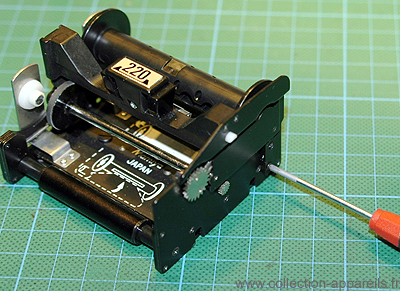 Note: it is possible to use cassettes type 220 with rollfilms type 120: simply remove the spigot secured by two screws (see Photo). 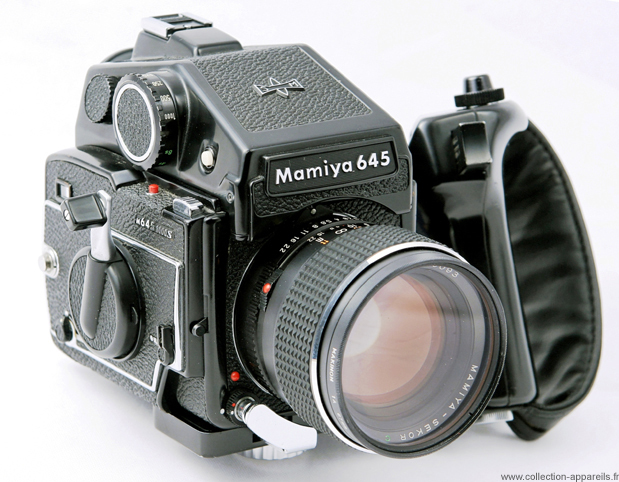 Designed for professionals, considered by some as a "wedding photographer device" but adopted by many demanding amateurs, the Mamiya M645, relatively reliable for its age, is an excellent choice to start with the medium format without breaking the bank .